Daffodils are all members of the Narcissus family and to many, the names are interchangeable. They are some of the easiest bulbs to grow and have been cultivated for centuries. Daffodils are native to Western Europe and have become naturalised throughout the temperate zones of all continents. There are over seventy species and 25000 cultivars. Their distinctive flowers consist of an array of petals at the base and a trumpet shaped centre. Flower colour ranges from whites through yellows and oranges to almost red. Sizes run from the very small Narcissus bulbocodium with grass-like leaves and Narcissus asturiensis, to the large flowered hybrids. They have twelve types based on flower form. Most can be grown in pots provided that they can be covered to one and a half times their own depth. Tazettas, known as jonquils have groups of up to a dozen strongly perfumed blooms and are often grown as pot plants to bloom from late autumn to spring. Daffodils are useful for almost any garden situation, for formal bedding, adding early interest to mixed borders and for naturalising in grass. Dwarf daffodils are ideal in rock gardens and raised beds. They rarely need lifting and are most reliable. Daffodils grow in almost any moist, slightly alkaline soil. They like full sun or dappled shade. Plant the bulbs in autumn, 4-6cm deep in cooler climates and deeper in warm areas, as much as 15-20cm. When planting in pots, use good quality, free draining medium. Keep the containers outdoors for six to eight weeks before bringing them inside. If the bulbs are to be naturalised in grass, allow the old foliage to die back before mowing for the first time. This allows the plant to replenish itself after flowering and forming its seed head. In bedding situations, the bulbs be lifted with the foliage and reburied, leaving the tops above the soil to die back naturally, much like ‘heeling in’ trees. Take care to mark the spot where they were buried otherwise they could be easily forgotten. Bulbs can also be stored in the ground or in pots of earth until needed again in the autumn. Daffodils are usually trouble free but may be affected by bulb flies, scale mites, nematodes, viruses and basal rot. 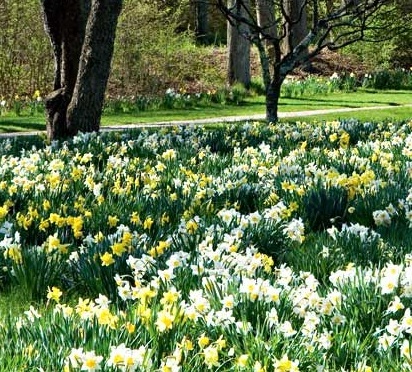 Daffodils can be propagated from offsets or by chipping. New hybrids are raised from seed resulting from cross-pollination. It takes some time to grow new plants from seed.